In 1866 the Fisk Free Colored School was established in Nashville, Tennessee by the American Missionary Association. Housed in abandoned Union hospital barracks, Fisk set out to educate former slaves with the support of donations from former abolitionists. As those donations declined over the next five years, Fisk fell on hard times. To save the institution, Fisk’s treasurer, George Leonard White, decided to gamble on the extraordinary voices of the young black singers who had begun to share with him the songs of their ancestors. 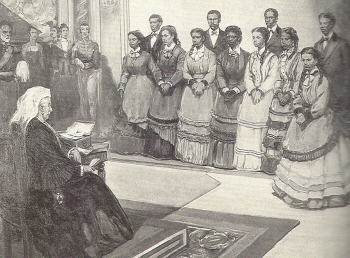 Over the objections of his colleagues and sponsors, White and his assistant, a frail young African American pianist named Ella Sheppard, led a choir of nine young former slaves (now called the Fisk Jubilee Singers) up from Nashville to perform for congregations in the North along the route of the Underground Railway. The Jubilees, as they were eventually called, struggled through a schizophrenic world of liberal ministers and adoring audiences, but also poor receipts, and segregated hotels, restaurants and trains. They made their way to New York, where they chose for their debut Steal Away, Swing Low, Sweet Chariot and Deep River, the secret hymns their ancestors sang in fields and cabins and brush arbor churches, the spirituals they were about to introduce into the universal canon of Christian worship,. Eventually they raised millions in today’s dollars for their school, enough to turn Fisk into a full-fledged university. They sang in great halls, cathedrals and palaces, delighting such luminaries as Queen Victoria, Mark Twain, Longfellow, Ulysses S. Grant, the royal families of Germany and Holland, and the Emperor of Japan. From platforms all over America they spoke out loudly and boldly against racism, forcing the issue onto the nation’s front pages. Andrew Ward, Dark Midnight When I Rise: The story of the Fisk Jubilee Singers who introduced the world to the music of black America (New York: Farrar, Straus and Giroux, 2000).